If you have read my Ubuntu 9.10 review last week, you must have noticed my reaction to the latest Ubuntu release was rather lukewarm. This makes today's Kubuntu review all the more intriguing. 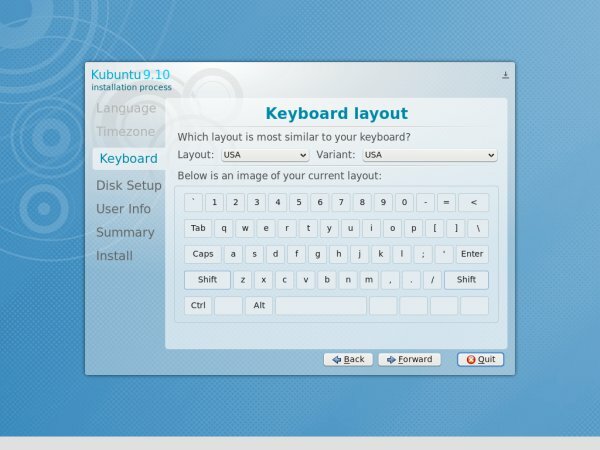 First, is there and why is there any difference between Ubuntu and Kubuntu, after all, they are pretty much the same distro? Then, what are these differences and are they any good? The title may blunt off some of the suspense, but you are in for an interesting read. 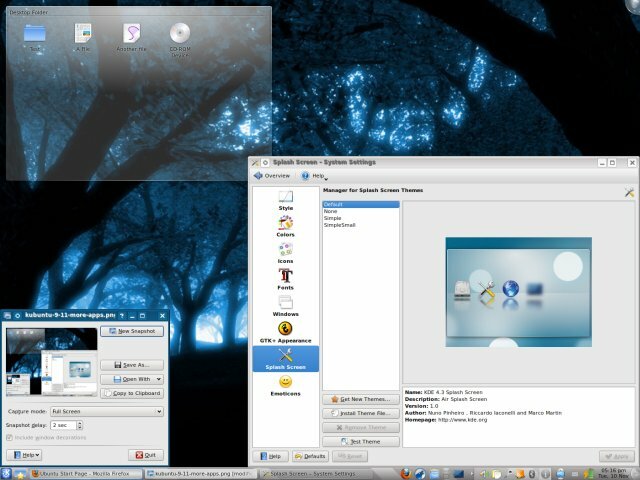 My first encounter with Kubuntu was three years ago, with the first LTS release, Dapper Drake. I liked it very much, as it was rounded and polished, with lots of cool features that promised new Linux users a pleasant, painless ride. Kubuntu 9.10 Karmic Koala has changed a lot since version 6.06, with a new uplift in the form of KDE 4.3.2, a new set of applications and utilities and significantly reworked internals. In today's review, we will see what Kubuntu can offer, in addition to a plethora of Ks. We'll examine the live sessions, covering Wireless networking, Bluetooth connectivity and desktop look and feel, we'll check the system performance and stability, including the standby and hibernate on laptops, we'll install Kubuntu, get acquainted with the latest KDE and the applications bundled with the distribution, and even take a brief look on the new GRUB 2 in a dual-boot configuration. No less importantly, we'll pit Kubuntu against its big brother, the Gnome-furnished Ubuntu, the flagship of the Canonical fleet. Like Ubuntu, I'll try Kubuntu on four computers, including three laptops, and two virtual machines, which should give you a decent indication how well the distro behaves. Ubuntu had quite a few surprising issues with application crashes, kernel errors and media performance. This makes the Kubuntu test all the more relevant. 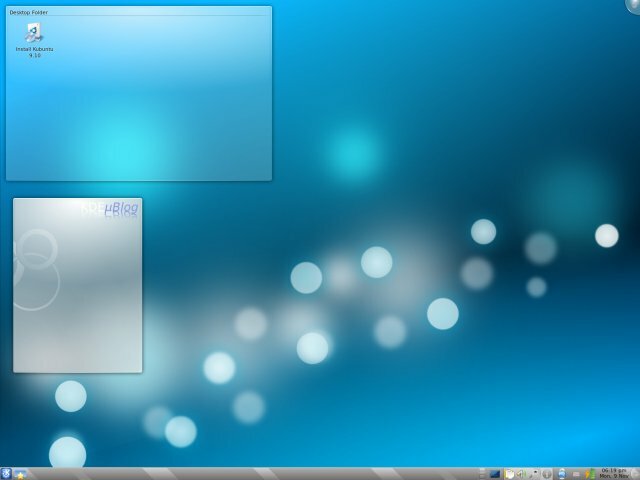 Kubuntu begins modestly, just like any Ubuntu flavor, with the well familiar boot menu. 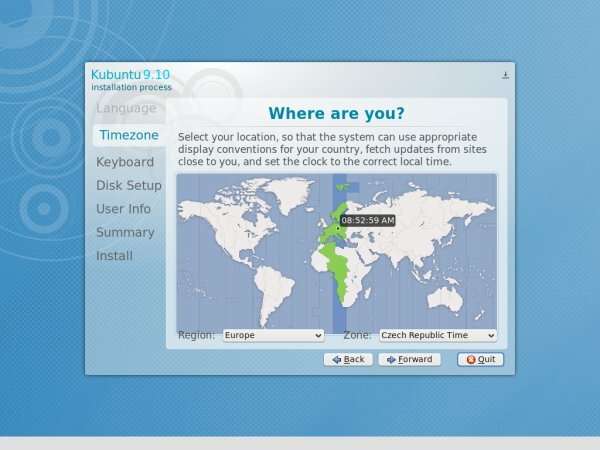 However, unlike Ubuntu, it still uses the old splash screen, like in version 9.04. This is a much better choice, especially since there is only one splash menu, reducing the panicky feel of clutter when booting. The new KDE 4.3.2 desktop is very nice. I must admit I have lost my love for KDE when version 4 was released and prefer the simplicity of Gnome, but the latest installment in Karmic Koala brings back some of the old passion. I know this is just an illusion, because the desktop does not look any different from previous releases or just about any generic KDE4 desktop, still, somehow, it feels better. It feels airy, polished and smooth. It feels well done. The blurry, hazy feel that used to annoy me is gone. The elements are somehow organized in a more streamlined fashion and the subtle feel of claustrophobia is gone. This is very important for any geek with a mild case of OCD. I honestly do not know if KDE 4.3.2 brings any change to the table, but it feels a whole new world compared to previous versions. For Windows converts, this definitely seems like the natural choice. And an expensive one, even more so for being free. We will talk more about the good looks after we install Kubuntu. No issue here on any one laptop (T42, T61 and RD510), which is a good thing. 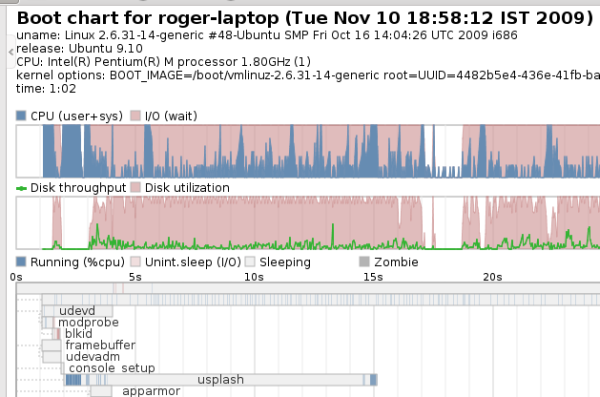 The KNetworkManager is less intuitive than its counterpart in Ubuntu, but it's manageable. One thing that is not immediately apparent is whether the networks are encrypted or not. Furthermore, when trying to connect, it does not automatically choose the right encryption method. In my case, it selected WEP whereas WPA2 was used. But once I made the changes, everything worked fine. You also have to remember to let it autoconnect if you want; it won't do that alone. Similarly, Bluetooth worked well. However, it was not turned on by default on some machines, so you may have to activate it manually. No issues here. 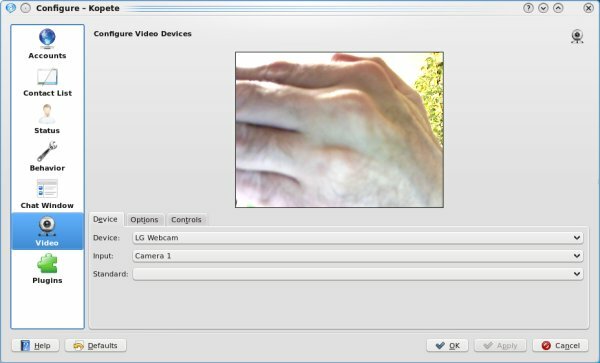 Using Kopete as the testbed, the camera worked great. Truth to be told, there weren't almost any. 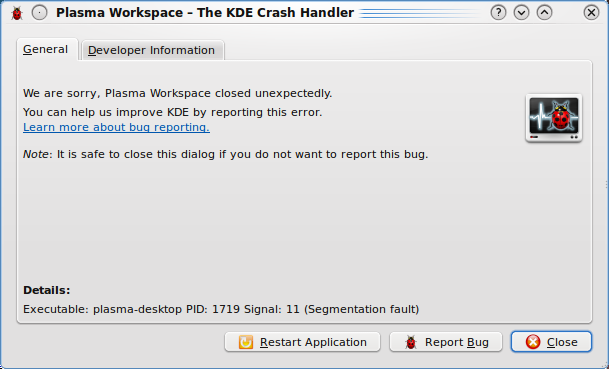 The only one was a Plasma crash, something that has happened to me in every single distro running KDE4 I've ever tried. It's almost a mandatory ritual. Overall, I was quite pleased with Kubuntu. It looked nice, it behaved nicely. It also surpassed my expectations, especially considering the last week's test, which made the entire adventure even more fun. If you've seen one Ubuntu (or rather Kubuntu) installation, you've seen them. There's nothing special here. 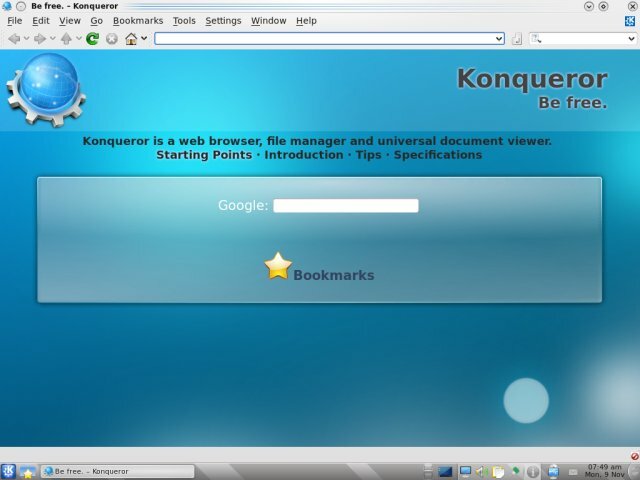 However, the installation menu is cramped and badly aligned on lower resolutions, with overlapping or partially visible elements, marring the experience, a traditional ailment of KDE desktops. Furthermore, there's no fancy aided installation slideshow like in Ubuntu 9.10. Overall, the installations were simple and painless, without any big issues seen. I would appreciate a better consistency in the menus and a behavior similar to Ubuntu. After all, both editions come from the same house and are essentially the same distro. 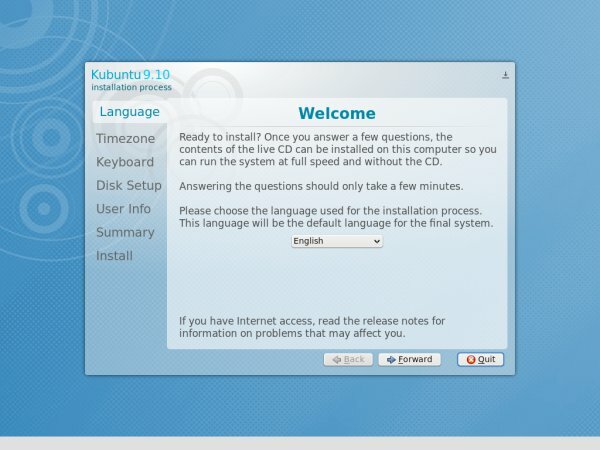 Some sort of an introductory slideshow would help new users get a feel of Kubuntu while it's installing. There were no issues with GRUB 2, except that Kubuntu is also labeled Ubuntu in the menu, so if you already have Ubuntu installed, you will now have two entries, pretty much identical. This can be confusing. There were no problems. The OS prober (a new feature in GRUB 2) found the other installation without any issues and added it to the boot menu. Let's see what we can do with Kubuntu Karmic. I already did my share of praising the new looks, but here's a more detailed take. Overall, KDE4 looks good, but you may want a more KDE3.5 look or a livelier wallpaper. You get the easy choice of changing things, with the centralized System Settings menu to guide you and a built-in wallpaper updater. On top of this soothing desktop, you have Plasma, which you can populate with links to documents or applications, URLs or widgets, some of which you may find useful, amusing or both. Plasma makes the KDE desktop more active and interactive, offering users a new mixed working environment that blurs the boundaries between what's online and what's not. 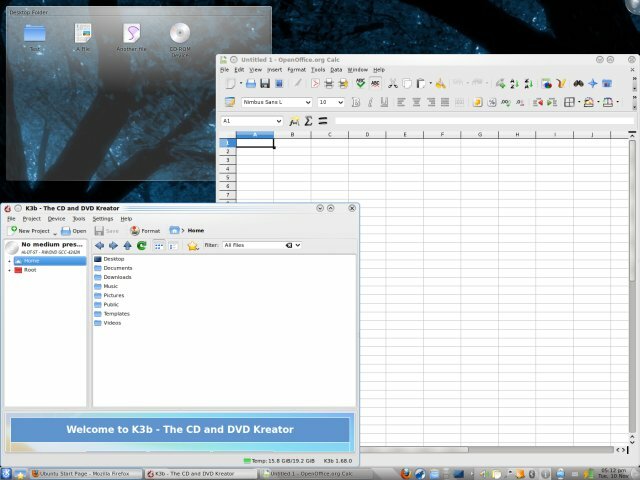 Younger people will probably love KDE4 more than oldsters, but it can serve both ends of the age spectrum. You can feel the polish everywhere. 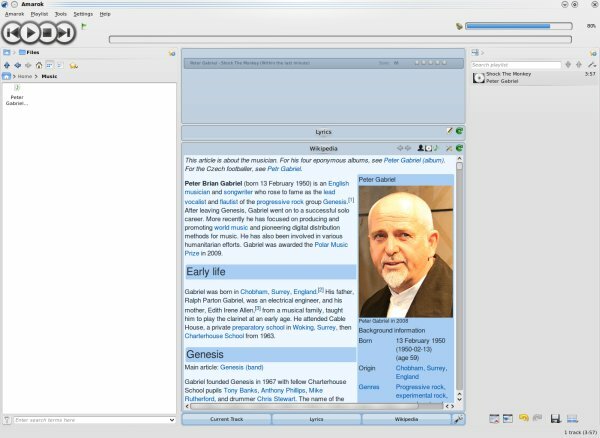 KDE4 used to draw lots of flak in its earlier releases, including memory consumption, crashes and unfinished looks. As an almost neutral observer, I do think most of these have been sorted out to a large degree. Amarok is also a great visual treat. We'll mention it again soon when we review applications. Dolphin is also quite lovely. 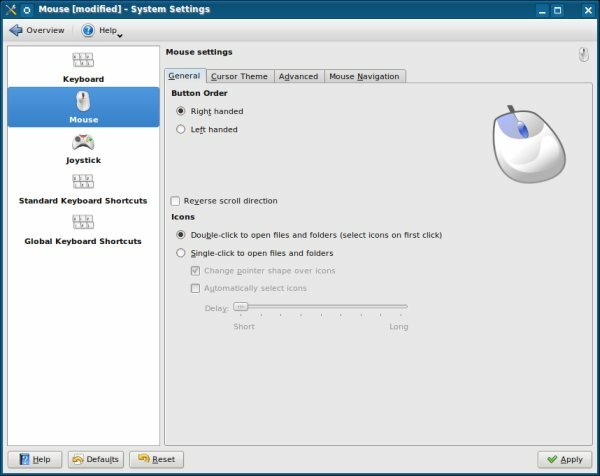 It avoids the clutter of KDE and presents the user with a simple, functional user interface, with delightful icon animations that please the eye. Notifications are a part of the overall soft, smooth, cool KDE looks. For instance, the package manager does not pop under annoyingly, interrupting your work, like games for instance. This is the new feature in Ubuntu since 9.04 and it's not a good one. Updates are important, but a simple red icon in the system area is enough. 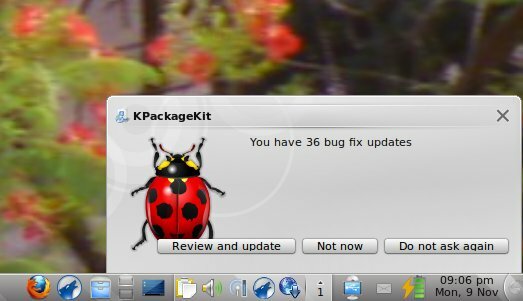 Kubuntu 9.10 is much better in this regard, showing a lovely ladybug notice, but it's contained in the right corner, away from your focus and nerves. This one should probably interest you a LOT, considering the large number of problems seen and encountered, not only by me, but many other users as well. Let me calm you down. 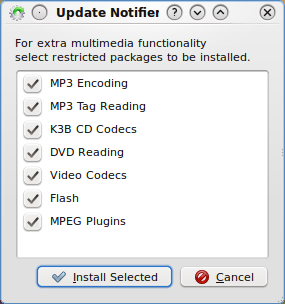 Kubuntu has no multimedia issues. Flash works fine, even when installed from the repositories, there are no audio/video issues in any of the applications. This is probably due to a different subset of applications used than in Ubuntu, emphasizing the need for a longer and more thorough test cycle, as I've always claimed. 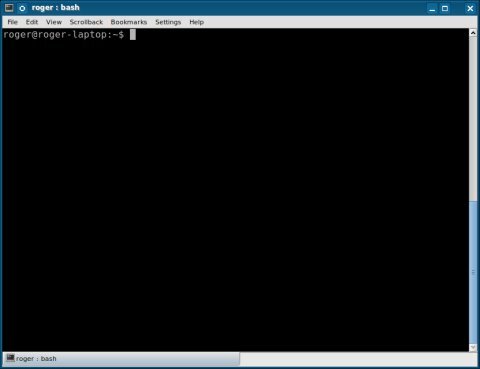 In this regard, the lack of spotlight plays into Kubuntu hands, making it a less likely candidate for new features and thus more stable. Once the codecs are downloaded, you will be enjoying all your media files and whatnot. Sorry about the image-less video screenshot, just weird X settings, but it's there, believe me. The video played all nice and dandy. The repertoire of programs is somewhat slim, although fairly balanced. Still, due to a much heavier print of the KDE desktop, Kubuntu has a fewer selection of utilities compared to Ubuntu. There's no GIMP for example. And you will have to install Firefox separately. Still, you have quite a few interesting programs to choose. There's Amarok, Kopete, OpenOffice 3.1, GwenView, K3b, and some others. Of course, you can easily add anything you want from the repositories. Kubuntu uses the popular, fast, sturdy apt-get in the background. The frontend is managed by KPackageKit, which replaces the older Adept. Frankly, I find the change refreshing and alarming at the same time. 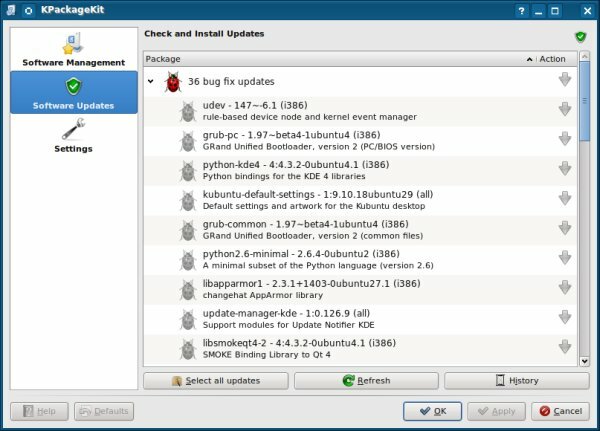 While Ubuntu maintains Synaptic forever, Kubuntu changes the default package manager, which can be tricky, since it is such a core utility. 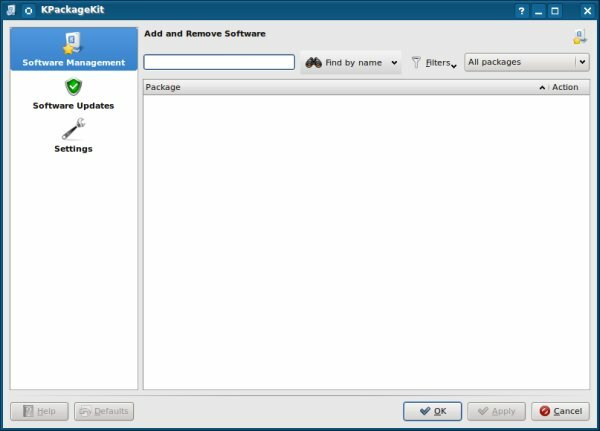 Compared to Synaptic, KPackageKit is slower, more cumbersome and less intuitive, but it works well. There's no Software Center or any new fancy like that. It's KDE through and through. On new machines, you won't notice any problems. However, on the older T42, with a slow disk, a weak processor and a reasonable 1.5GB RAM, Kubuntu started to stutter with several programs running. 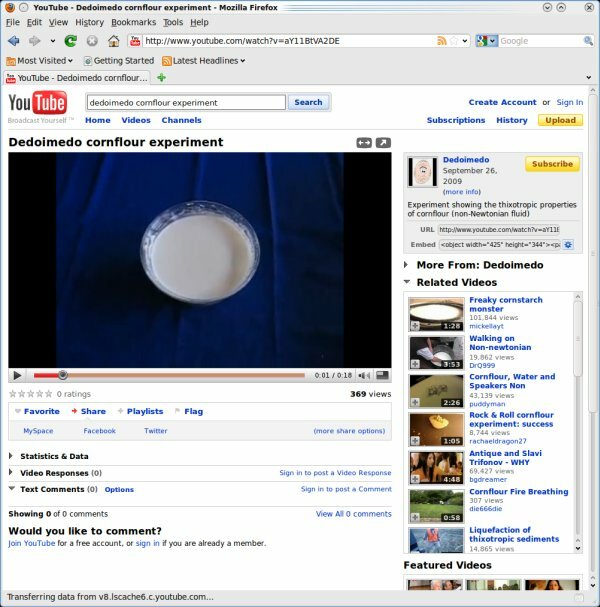 With Firefox open and running some 15 tabs, OpenOffice, Amarok, and Kopete active, the desktop experience became sluggish, with applications taking as much as 1-2 seconds to respond to mouse clicks. You may say this is a respectable fight from a five-year old laptop, but it still may bother many users. What surprises is that both Ubuntu and Kubuntu take only about 300MB RAM and both take the same time to boot, using bootchart for profiling, with 62 seconds on the elderly T42. 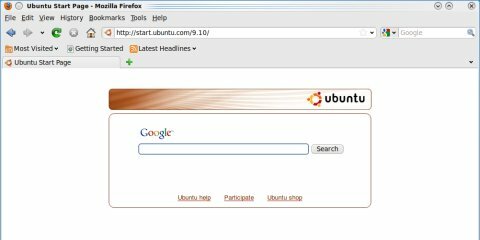 Nevertheless, Ubuntu is much faster and quicker to respond and the difference is quite noticeable. This is probably the KDE at work. Just for comparison, Ubuntu 8.10 used to take more than 2 minutes to boot on T42, which fits the findings I reported with Jaunty, namely that is slices the boot times in half, but there's no drastic improvement in Karmic. Once again, probably due to less focus on getting new things into the distro in a rush, Kubuntu gains on stability over its big brother. 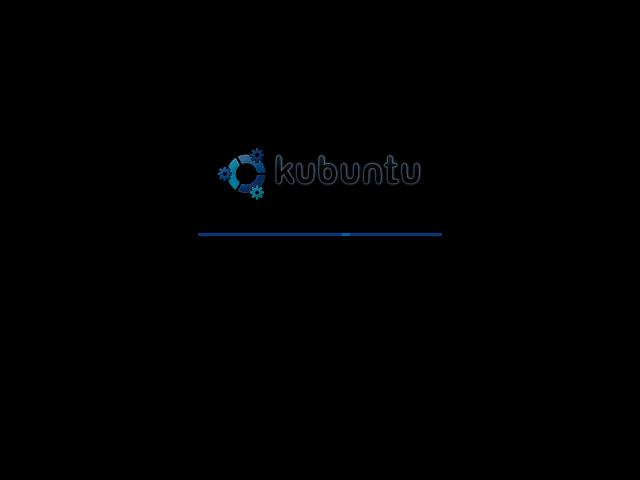 While Ubuntu suffered from quite a few application crashes, kernel errors after suspend and no recovery from hibernate, Kubuntu was a different story. Suspend and hibernate both worked perfectly on all laptops, with no visible errors. On T42, there are no drivers for my old T42, which is a shame. I don't see why Linux developers should abandon the old machines, on which the very distros developed can run as a great alternative to a much heavier Windows. What more, in general, the combination of little dial-up support and no decent drivers for older hardware makes you wonder if there's merit in running Linux on old hardware or just throwing it away into the dust bin. 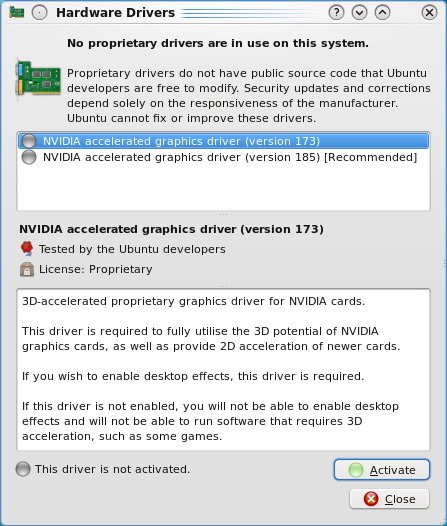 On RD510, Nvidia drivers were offered, no worries, as expected, but it's a new machine with a new graphics card. Dial-up wise, Kubuntu has a built-in KPPP utility, which is commendable. I have also reported issues with the installation of VMware Tools in virtual machines. Again, Kubuntu evades these. There were quite a few warnings when trying to compile the tools, but the procedure completed successfully. There were some problems, after all. 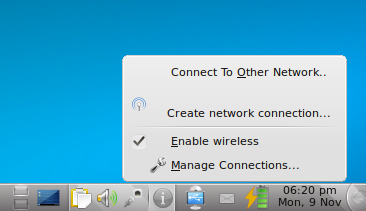 Kubuntu has no easy way of getting into Windows networks like Ubuntu. You will have to manually specify smb://IP-address into the address bar in Dolphin to open Windows shares and even then, it will start asking for username and password and fail. In this regard, Ubuntu clearly wins. Since I've observed this issue with some other distributions as well, I would conclude this is a KDE thing. 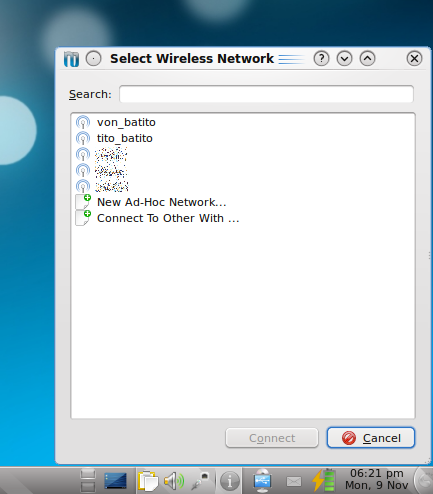 Kubuntu did not cooperate well with proxies, even though I configured them. 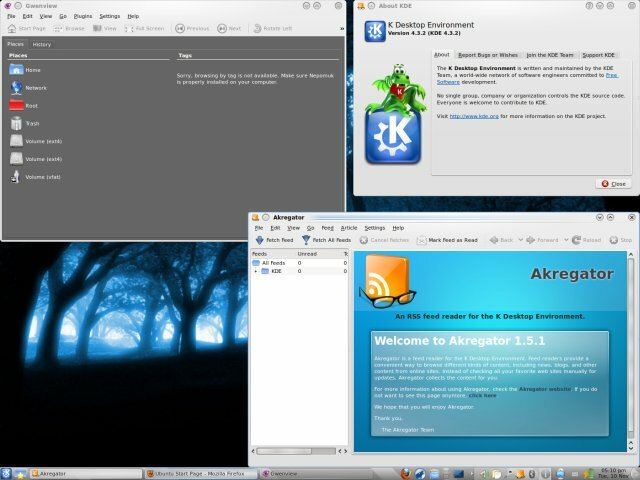 Some of the programs would work, others would not, undermining the KDE integration. 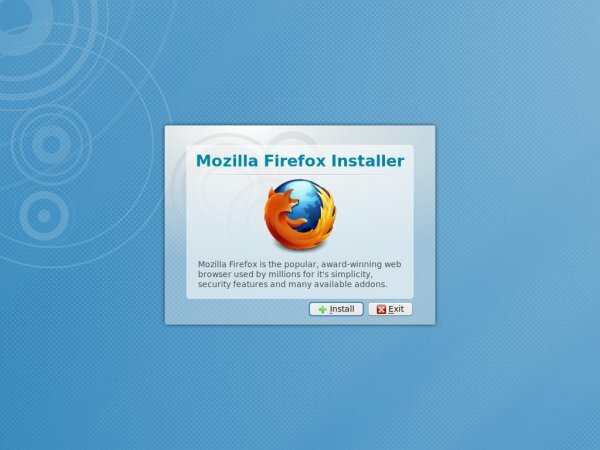 The sore point was the rather lovely Firefox installation script, which we have seen earlier. Firing it up with proxy configured won't do much; it will sit there and you won't have your Firefox without going for the command line. Another thing that stood was Firefox. 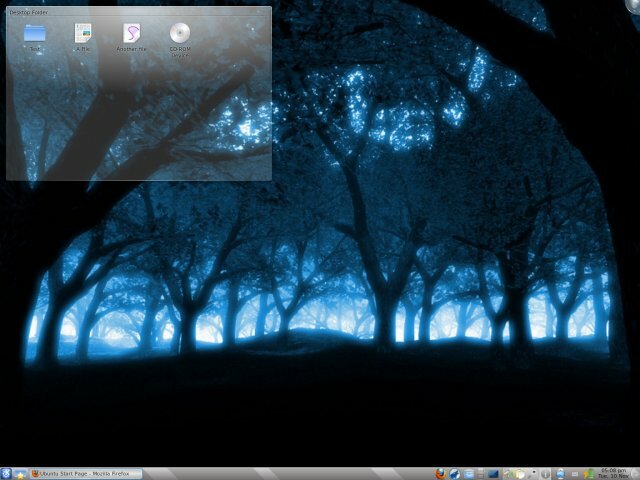 It used the brown Ubuntu theme and Gnome fonts, out of place in the frosty, K environment. 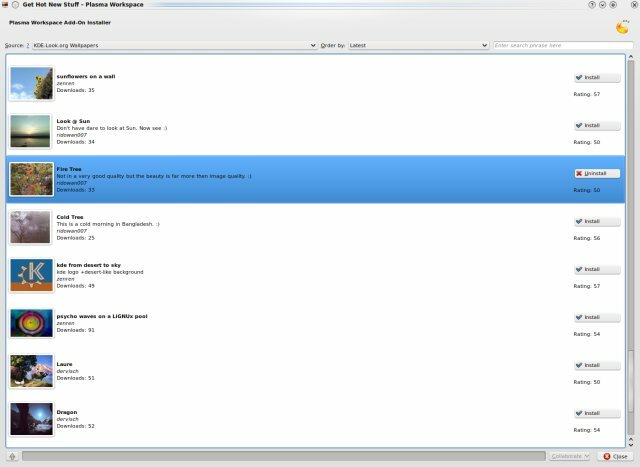 Although KDE is configured by default to force the Qt style onto any Gtk app, Firefox evades the branding and remains out of place visually. It's still the same great browser, though. We mentioned earlier, but being fast and responsive is not Kubuntu's main feature. If you have weak machines, Kubuntu may not be the best choice for you. It will run, but you may not like the responsiveness. There was no way to enable touchpad clicks. Not that I'm against it, but some people might like this. They are tiny (size 8 maybe) and will strain your eyes on even medium resolutions. Here's a screenshot, with the size increased by 50%. Even so, it's still rather small. Speaking of screen resolution, KDE apps are geared toward higher resolutions and usually do not display well on lower ones. This leads to funny overflows of text outside their designated boxes and buttons, scrunched up menus and a general feel of chaos and clutter that diminishes the professional feel of the distro. I would suggest building all menus against lower settings, like 1024x768 and then build from them. Today, most KDE apps will not look well below 1280x1024. You can also see in Konqueror on smaller resolutions. 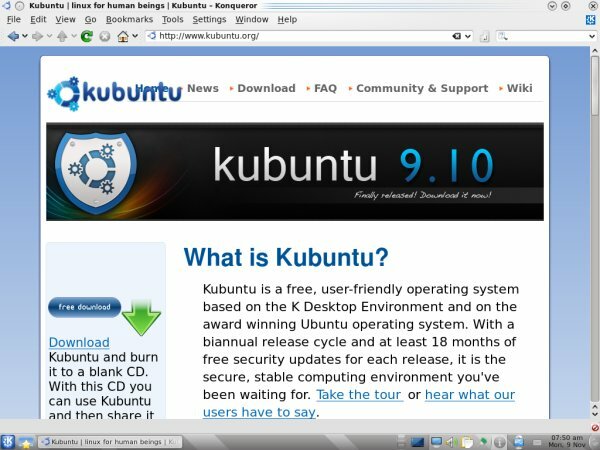 The very Kubuntu website does not display properly, with overlapping elements, which is really a shame. One more than thing that stands out on the Kubuntu website is a number of glaring spelling errors, like reborting bugs ... I do not know what rebort is, but I think it should be report. I do not know what this thing is (I'm just pretending, kind of like a normal user), but it popped every few minutes asking for permissions. Since there's no obvious explanation what this thing is and what it does, it can frighten new users. It's similar to the keyring thingie in Ubuntu and frankly, rather unnecessary if you ask me. Kubuntu 9.10 Karmic Koala is very, very nice. It's a pleasant surprise. And it's better than Ubuntu. It is not without issues, but they are mostly cosmetic and related to KDE. 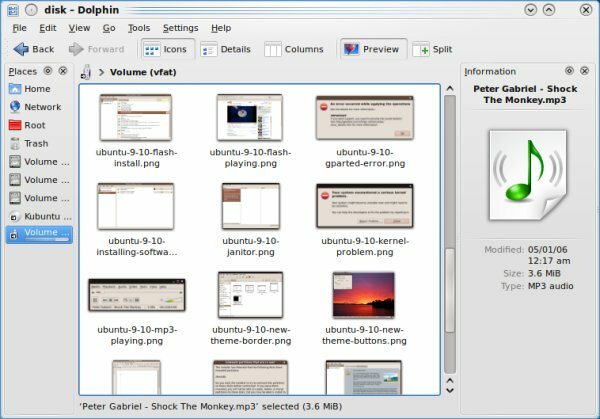 Better integration of elements and more attention to visual layouts would help make the distro look smarter, sharper and more consistent on higher as well as lower resolutions, improving the feel and quality. KDE4 looks fabulous and strives to looks ultra-professional, but it still has a lot to go. 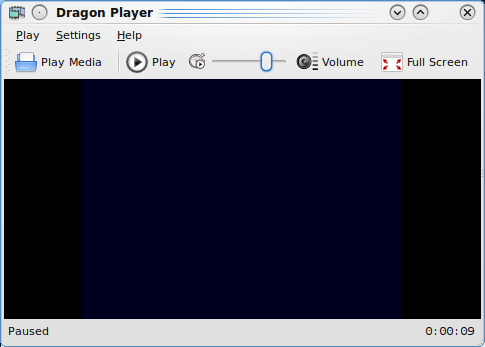 Then, there are the occasional Plasma crashes (still), which need to be sorted out. Proxy and Samba are not to be neglected though, as they can seriously scar the experience. On the other hand, Kubuntu delivers an almost perfectly stable environment, with no kernel errors, no torrents of application crashes, and good support for hardware and peripherals. Performance can be an issue on old and weak machines, which are not designed to run the latest KDE. Even if you have decent RAM, you will hit the sluggishness barrier rather quickly. I would not install Kubuntu on netbooks. All combined, Kubuntu stands ahead of its big brother, Ubuntu. Its problems are less critical for most people and are not unsolvable. Kernel crashes or broken audio tend to be more serious. If you're considering trying the latest Ubuntu release, I'd say try Kubuntu. It's lovely, polished, smooth, runs well, and will cooperate with your hardware. You will also get a decent array of programs to begin with, plus lots of eye candy to please you while you grunt over and smooth the bumps you find along the way. My liking for KDE has just been rekindled.